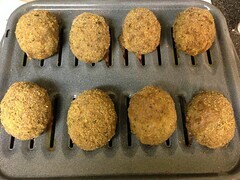 One of the things I like best about scotch eggs is that they can be prepared ahead of time, and used as a grab & go food. They are good cold, sometimes they are even better this way than hot, depending on your sausage. Often, I will make a batch of them at the beginning of the week, and keep them in the refrigerator pulling one (or two) out each morning for a mid-day meal. They can be eaten as-is, sliced, or dissected (cut in half, separating each layer). They go excellent with a brown mustard, and maybe with honey as well (though I haven't tried it). So, what is a scotch egg? 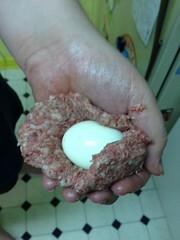 At it's most basic, it's a hard boiled egg that's been wrapped in ground sausage, then cooked. You may also notice that I only refer to them as scotch eggs and not Scotch eggs . This is because they aren't Scottish, they're English. 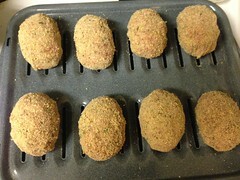 Many scotch eggs (including he original) were fried. 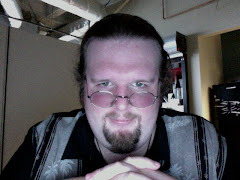 I bake mine, because a) that's how I was taught, and b) I like the taste of the baked ones better than the fried ones. So this recipe will be for a baked scotch egg, rather than fried. So, here's what you'll need for a batch of 4 scotch eggs. Shell your hard boiled eggs (I know it says shelled eggs up there, but it's really important that the hard boiled eggs not have shells on them). 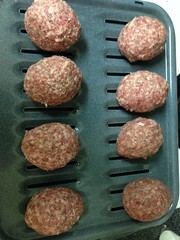 Divide your sausage into fourths, so you have a quarter pound of ground sausage per hard boiled egg. Now, without the humorous alcohol steps. 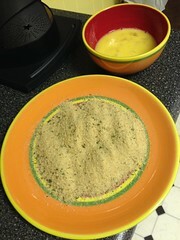 As I stated above, this is an easy food to make, it's paleo-friendly (just omit the breadcrumbs), and very, very tasty. 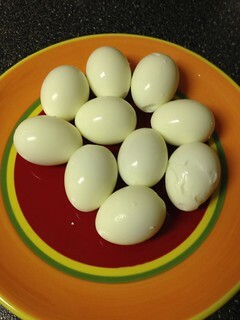 After the eggs are cool, you can put them in zip-top bags in your refrigerator for a quick meal/snack ready to go. I do highly recommend trying them with a good brown mustard though. 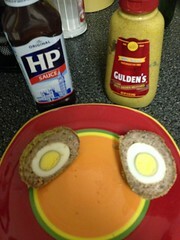 And finally, this scotch egg recipe post would not be complete without a link to Weebl's Scotch Egg animated song!